About The Weasel: Why Does He Ponder? 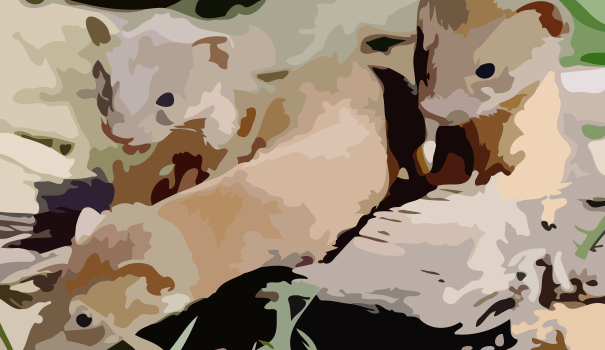 The Weasel founded PonderWeasel.com after the his obsessive lust for random facts was given the opportunity to share this knowledge with the world. You see, the Weasel can read and write, but lacks the anatomy to speak (thanks a lot, Darwin). Before the prominence of communication through the internet, the Weasel was just another run of the mill reading and writing Weasel wandering the countryside. As a young tiny weasel foraging for small mammals to survive, the weasel learned that things like acronyms, haiku, and the definition of triskaidekaphobia served very little purpose to his survival. It wasn’t until years later that the Weasel would get his shot when Al Gore pretended to invent the internet. It was then the Weasel got his first computer, which he built from pin ball machine parts he found in a dumpster behind a Chuck E. Cheese. Today PonderWeasel.com stands for those who seek knowledge, not always useful knowledge, but knowledge nonetheless. The Weasel has since turned his small website into a family affair. There are now handfuls of Weasel descendants sharing information and interacting with people who ask for the Weasel’s assistance. The Weasel stands for stuff, not necessarily important stuff, but stuff none the less. The Weasel believes in providing high-quality, fact-based information about STUFF (any topic under the sun). The Weasel openly admits that even facts can be skewed. So the Weasel and his family of furries are constantly revisiting previous information on PonderWeasel.com to ensure the facts are, in fact, FACTS. The Weasel spares no expense (difficult as the Weasel has no pockets for money) to track down reputable sources and people for our information. The Weasel and his team use dictionaries, encyclopedias, industry experts, and at times, perhaps even a little opinion to answer questions. The good news is that the Weasel is a reading and writing weasel, which is really impressive so his opinion is probably worth more than an encyclopedia’s anyway. PonderWeasel.com features a steady stream of random facts from highly trained Weasels. They are better trained to rollover, clap, and sit than write, but still can create interesting articles, which is nice. The Weasel is committed to helping you. The Weasel hopes you enjoy the site and decide to share it with your friends on your favorite social media site. You can find us on Facebook and Google+.